Burrito Blog: Torta! Torta! Torta! All of 2006 has been super productive, but this day everything seemed to go wrong in one way or another. I'll spare you the details of my Internet woes. 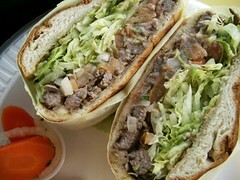 In an effort to bring some joy to my day, I got the carne asada torta from Benitos. This one was smaller than some tortas I've seen in the past, but no problem. Overall, it was pretty good, but the dark cloud on my persevered. I was overcharged, no refund was issued, and the flaws in my day continued. Benitos, I hold you responsible, but forgive you. This Benitos Taco Shop meal was rated: 5.1. Wednesday, March 01, 2006 by Jonah.